Jayarava's Raves: What Did the Buddha Mean by 'World'? I have been working on a commentary to the Kaccānagotta Sutta (SN 12.15, PTS Sii.16.) and considering the term loka, usually translated as 'world', and how the Buddha used it; especially in the context of the compound lokasamdaya 'origin of the world'. In my research I found a trail already followed by Bhikkhu Bodhi in the notes to his Saṃyutta Nikāya translation. I will work through these texts myself, offer my own translations and observations, but leave Bhikkhu Bodhi the last word, since he got there before me. kena cāvuso lokasmiṃ lokasaññī hoti lokamānī? And by what, friend, in the world is one a perceiver and cogniser of the world? Is there a way by travelling to know, or see, or to reach, the end of the world where one is not born, grow old, die; where is is no death and rebirth? Na kho panāhaṃ, āvuso, appatvā lokassa antaṃ dukkhassa antakiriyaṃ vadāmi. Api ca khvāhaṃ, āvuso, imasmiṃyeva byāmamatte kaḷevare sasaññimhi samanake lokañca paññapemi lokasamudayañca lokanirodhañca lokanirodhagāminiñca paṭipadanti. However, I, friend, there is no making an end of disappointment, without reaching the end of the world. And, friend, it is right here in this 'fathom long'  body endowed with perception and cognition that I declare the world, the origin of the world, the cessation of the world, and the way leading to the cessation of the world. Iti – ‘‘nāhaṃ, āvuso, imāni cattāri saccāni tiṇakaṭṭhādīsu paññapemi, imasmiṃ pana cātumahābhūtike kāyasmiṃ yeva paññapemī’’ti dasseti. Thus he should see: ' I do not, friend, declare these four truths in grass and wood, but I declare them only in this body of the four great elements'. Now this is presented as a quote from the Buddha, but modern databases make it easy to show that it does not occur in the Pāli texts that have come down to us. So we must be cautious in how we use it. With this caveat I may say that this the most unequivocal statement that the Buddha is unconcerned with the objective world, but only with the subjective world, that I know of. What in effect Buddhaghosa, at least, is saying is that paṭicca-sammupāda is not intended to apply to the external world, but to one's world of experience - to the processes of perception (the senses) and cognition (the mind) located within the body. Cakkhuñca paṭicca rūpe ca uppajjati cakkhuviññāṇaṃ. Tiṇṇaṃ saṅgati phasso. Phassapaccayā vedanā; vedanāpaccayā taṇhā; taṇhāpaccayā upādānaṃ; upādānapaccayā bhavo; bhavapaccayā jāti; jātipaccayā jarāmaraṇaṃ sokaparideva-dukkhadomanassupāyāsā sambhavanti. Ayaṃ kho, bhikkhave, lokassa samudayo. With the eye and forms as condition, eye-consciousness arises. The coincidence of the three is contact. On the basis of contact there are sensations, which give rise to desires. Desires are fuel which supports becoming. With becoming there is birth, and from birth old-age, and death, grief, lamenting, misery, dejection, and trouble are produced. This, monks, is the origin of the world. This is a portion of the nidāna chain (the most useful and relevant part) which we normally associate with the arising of dukkha. Here the world is more or less equivalent to dukkha. Note that 'the world' comes into being on the basis of contact between sense organ and sense object - forms. Here forms are not part of 'the world', they are part of the conditions which give rise to the world - this is a very important distinction. The nidānas do not give rise to forms, they give rise to the experience, the world of suffering. 'fathom long carcass' is (I think) Mrs Rhys David's translation of byāmamatte kalebara which has a great ring to it: but byāma refers to 'an arm-span' which is typically somewhat less than a fathom or six feet. Kaḷevara (or kaḷebara) is 'the body'. It also means 'a corpse or carcass', but a dead body is seldom "endowed with perception and cognition"
upādāna is typically translated as 'clinging'. This is neither bad doctrine, nor bad philology. However Richard Gombrich has shown how the word more literally means 'the thing which supports a active process' i.e. fuel. The equation that "desire fuels becoming" is part of the metaphor of fire, which characterises becoming (bhava) as like a fire which can only continue when there is fuel. In my opinion it makes more sense. I've written more on the use of the metaphor of fire in these essays: Everything is on fire! and Playing with Fire. Bodhi. Connected Discourses p. 394, n.182. 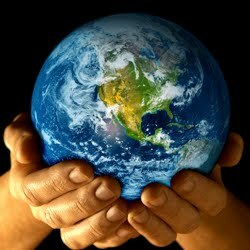 image: earth in hands from Worthington Libraries.